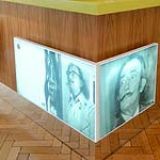 Located along London's South Bank, The Dali Cafe offers an inspired menu encompassing the spirit of Salvador Dali himself. 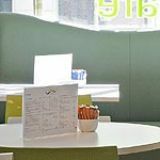 They offer a range of main meals, sandwiches, snacks and freshly baked homemade cakes. Do you work at The Dali Cafe? What did you think of The Dali Cafe? Wow what can I say, the cakes are so wonderful here I actually put aside all shame and had two! The Dali Universe exhibition at County Hall is a fascinating tour around the mind and work of Catalan’s most famous artist. The exhibition now has its own cafe inspired by Dali and Spain, although you needn’t visit the exhibition to enjoy the excellent food and drink. County Hall, once the seat of government of the old London County Council and later the Greater London Council, is now a conglomeration of hotel, restaurants and exhibition spaces including the London Aquarium and the Dali Universe exhibition. Just opened next to the Dali exhibit is the new Dali Cafe, a pleasant little room with a view of the river, but which is actually a lot more than just a cafe. 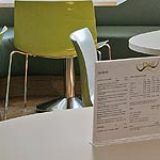 Its menu takes in gourmet sandwiches, salads, hot dishes, puddings, homemade juices, plus other soft drinks, hot beverages, and it’s licensed too for wines and spirits too. 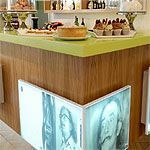 Far from being the strange place you might expect from something named after a surrealist painter, the Dali Cafe is a congenial, light and bright affair. There are photographs of the artist on the wall and the colour scheme is organic: green seats and white topped tables. You place your order at the bar for the takeaway service, otherwise just take a seat for table service. 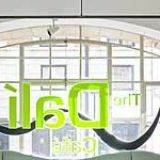 The staff are all very pleasant, helpful and confident in the knowledge that they’re doing something different and taking cafe culture up a notch or two. This is cafe food of a very high order indeed. Just reading the menu will make your mouth water. Chef Sebastian Ryder has produced a menu with Spanish influences, with over a dozen delicious gourmet sandwiches with fillings such as crayfish, rocket and lemon, roasted vegetable with smoked apple-wood cheddar and hot corn-fed chicken with lemon and sage. Prices are from £3.25 to £4.95 (£2.70-£4.10 to take away). These are main course sandwiches, i.e. a meal in themselves, and they are handmade with good hand-sliced bread. The menu’s salads make perfect starters at £5.95 to eat in. There are a choice of seven, including: roasted cherry tomato, chorizo and watermelon; fennel and watercress with blood orange and pine nut, and Torres poached pear with blue cheese and rocket. Recommended choices are the Serrano ham, artichoke and plum tomato salad, and the fresh pea, ham hock and Manchego cheese salad. The Spanish ham is really good, with thin slivers tossed among a mixture of salad leaves and studded with the tomatoes, black olives and artichoke - a very tasty combination. The mixture of the peas with the ham and the hard Spanish cheese makes another platter of unusual tastes and textures. All the ingredients are beautifully fresh. Hot dishes include a soup of the day, baked free-range eggs with chorizo sausage, Tortilla Espanol and cherry tomato and pine nut flat bread. The deep-filled quiche is freshly made, soft and eggy with pieces of boiled egg within its creamy custard filling (£4.95) and the Catalonian beef pie (£6.95) is a revelation: beautifully tender chunks of marinated beef in a shortcrust pastry. This Catalonian version knocks the traditional English version into oblivion. If any football crowd wants the best beef pie in London, just go to the Dali Cafe. Both dishes were well garnished with salad leaves to make really prime platefuls. For desserts (from £2.50) there are the most astonishing cupcakes with a towering mountain of buttercream frosting on top, and the wonderfully fruity strawberry cheesecake is also a winner. But, last but not least, is something called Jammie Dodger shortbread. Imagine a Jammie Dodger biscuit the size of a chocolate Wagon Wheel, but made out of the best and butteriest shortbread with a thick layer of jam between. This is the cafe’s signature dessert and it may not be Catalonian or even Spanish, but it’s great with a cup of good coffee. A selection of nice, healthy juices dominates the drinks list, with names reflecting Dali’s life and work. A cocktail of carrots and clementines is called a Salvador Dali, Woman Aflame has broccoli, pear, beansprouts and green grapes and Spellbound is raw beetroot, carrot, orange and spinach. Cosmos is a mixture of red cabbage, fennel bulb and celery with apple and lemon juice: a deliciously tangy smoothie that you can feel is doing you good. A short wine list of three reds, three whites, two roses and two sparklers, is quite adequate for a cafe like this, as it isn’t the sort of place where you would drink too much alcohol. If you do drink, however, the Torres Mas Rabell is a good choice that goes well with the food available. There’s a collection of different teas and huge cups of coffee are available for just £2. London doesn’t have enough places of the quality of the Dali Cafe, so this new addition to the South Bank is very welcome. Other outlets of a similar nature should take heed because, if they don’t watch out, this place is going to beat them at their own game.